The double spiral rope is a variation of the spiral rope stitch that uses two sections of beads in each complete stitch. When these beads sections are different colors, the results will be two sections of spiral beadwork wrapping around each other. You will find it easier to stitch double spiral rope if you are at least familiar with regular spiral rope stitch. They are very similar but even if you have no experience with the spiral stitch you'll be able to follow these instructions. There are plenty of opportunities to vary this stitch according to the beads and materials you have available. To make a double spiral rope, you will need at least three different beads: a bead for the spine (also called the core), and two different colored beads for each of the spirals. You can also use additional beads for embellishment. The thread for this project must be able to fit through the core beads multiple times. A gel spun fishing line type of thread (Fireline, WildFire or DandyLine) is preferable to a nylon thread since the thread might split on the multiple passes. They are also less likely to stretch than a Nylon thread like Nymo. To get started, cut a comfortable length of beading thread. Use as long a length of thread as you are comfortable with. String a stop bead on one end, leaving at least a 6" tail. You may need a longer tail, depending on how you plan to finish the double spiral rope and the type of clasp you will use. Thread the needle on one end. The double spiral rope can be made with differing numbers and types of beads. As a general rule, the spine bead size must be larger than the spiral beads. For double spiral, size 6 or size 8 beads work well for the center spine and size 11 beads work well as the spiral. Each stitch of double spiral will go through a certain number of spine beads and add a specific number of spiral beads. In general, the length of the spiral beads in each stitch should be slightly shorter than the length of the spine beads in the stitch. For example, this project uses five size 8 beads in the spine and seven beads for each spiral stitch (six size 11 and one 1.8 mm cube bead). Pick up the spine beads and spiral beads for the first stitch. Stitch back through the five spine beads. Pull the thread to make a loop with the beads. You will have a row of spine beads with a row of spiral beads along side of it. Thread tension is very important for double spiral stitch. Even if you normally like very tight thread tension, moderate thread tension works best here. You will need enough wiggle room in between the spine beads to fit the needle between them for each stitch. Pick up three size 11 beads, a cube bead and three more size 11 beads in the second spiral color. Stitch back through all of the same spine beads and pull the thread through. Do not pull too tightly. For each double spiral stitch, keep the stitches of the same color together. To start, you will have one color on the right side of the spine beads and the other spiral color on the left side as shown in the picture. Pick up one spine bead (size 8) and seven more beads in the first color (aqua/bronze) for the second spiral stitch. Stitch back through four spine beads and the spine bead you just added to make five in total. Pull the thread through and let the loop of beads lay on top of the ones of the same color from the first stitch. To complete the second half of each double spiral stitch, flip the beadwork over so the second color is now on the right as seen in the picture. Pick up seven spiral beads in the second color (sapphire and bronze). Do not pick up another spine bead! Only the first half of each stitch (i.e. the first color) will include a spine bead. The second half of the stitch will go through the same five spine beads as the first half of the stitch. Stitch up through the spine beads and pull the thread through allowing the loop of beads to lay on top of the beads of the same color from the stitch before. When you have pulled the thread through, flip the beadwork over so the first color is on the right again. Pick up one spine bead and the spiral beads for the next stitch. Put your needle through the four spine beads and the new spine bead you just added. Flip the beadwork over so the second color is on the right. Pick up seven spiral beads and stitch up through the last five spine beads. Keep pushing the new beads to the right side on top of the prior stitch of the same color. As you continue flipping over the beadwork, and adding rows of beads, the spine beads at the bottom will begin to be fully covered by the spiral beads. The distinct double spiral will begin to take shape. There will be a section of spine beads that remain uncovered from where you first began the stitch. It is optional if you want to cover these or not using the following instructions. Once your rope has reached the correct length, begin the finishing techniques described on the next slides. You will probably need to add at least one new thread to make a bracelet. The best way to do that is to loop back through one or two prior stitches to end the old thread and do the same to add a new thread. There is a helpful diagram on one method of ​ending and adding thread to double spiral stitch at the Fusion Beads website. This step is optional and is one way to finish the rope by covering the small area of spine beads that is left uncovered. To cover the spine beads, you will repeat the spiral stitch into the next group of four spine beads decreasing the number of beads in each spiral stitch so it is in proportion to other stitches. ​In this case, the first stitch to cover the spine beads used five ​size 11 beads and one cube bead. The second half of the stitch is repeated using the same bead amounts in the second color. The next stitch to cover the spine, shown here, decreases the spiral beads to three size 11 beads and one cube bead. For each stitch, you will need to try to keep the cube beads aligned to continue the spiral pattern. Adding the beads to cover the spine will result in a fuller, rounder double spiral rope. If you would like a more gradual end or plan to use a cone on the ends, it would be easier if you don't follow these instructions to cover the spine beads on the ends. There are many options on ways to add a clasp. For this bracelet, the thread is passed through a 4 mm bicone crystal, a 9mm textured oval jump ring from Nunn Design, and then back through the crystal and a spine bead. This pattern is repeated until the jump ring is secure, about three or four passes. Weave the thread ends into the spine and spiral beads tying half hitch knots around the thread to secure it. Trim the thread end. Repeat for all other thread ends. The completed double spiral stitch bracelet. 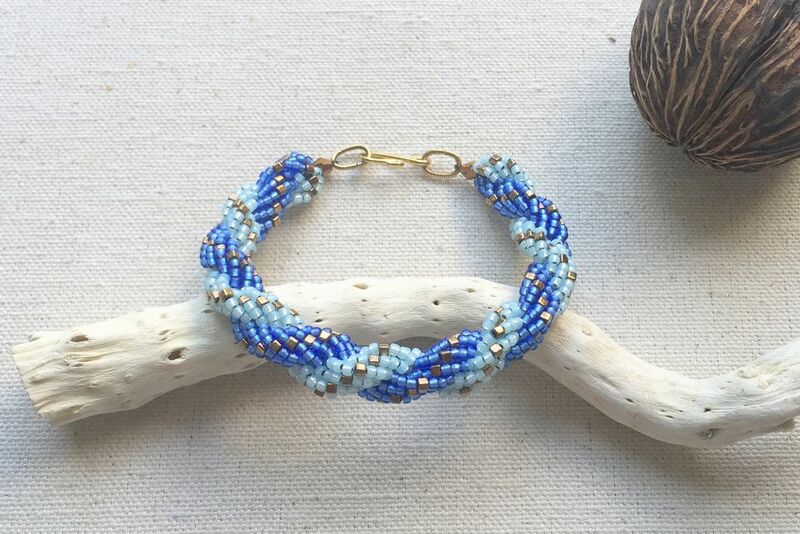 One of the hardest parts of making this bracelet can be completing the second half of each stitch. Be sure to push the rows of beads over to reveal the spine beads you need to stitch in between. You can also gently bend the beadwork to help give space to put your needle between beads. A thicker and shorter beading needle can help get between the beads. A thin needle will bend and is likely to get ruined while making this bracelet.